The legality of a state regulating the sale and rental of violent video games to minors will be decided finally by the U.S. Supreme Court, the justices decided today. Whatever the outcome, the decision of the justices could have a much wider impact on how freedom of speech is treated in the United States. SCHWARZENEGGER, GOV. OF CA V. ENTERTAINMENT MERCHANTS, ET AL. was one of two new cases the court granted Monday for a decision next term, which kicks off on Oct. 4. In granting the write of certiorari, the court also denied the motion of California state senator Leland Y. Yee to file a friend of the court brief. While cases like this have been repeatedly won by the video game industry in different states, the U.S. Supreme Court decision will have national implications. A decision to not hear the case would have affirmed California's previous judicial defeats and serve as another in a long line of gaming industry victories against state authorities trying to legislate against violent games. The California fight began in late 2005 when the state's Governor, Arnold Schwarzenegger, signed into law regulations that would fine retailers of up to $1000 against people who sell intensely violent games to minors. While no such laws exist pertaining to the sale of violent movies or DVDs, state officials argued that extremely violent games could prove harmful to minors. "Courts throughout the country have ruled consistently that content-based regulation of computer and video games is unconstitutional. Research shows that the public agrees, video games should be provided the same protections as books, movies and music," Michael D. Gallagher, president and CEO of the ESA, wrote in a prepared statement to Kotaku. "As the Court recognized last week in the US v. Stevens case, the First Amendment protects all speech other than just a few ‘historic and traditional categories' that are ‘well-defined and narrowly limited.' We are hopeful that the Court will reject California's invitation to break from these settled principles by treating depictions of violence, especially those in creative works, as unprotected by the First Amendment." "A poll recently conducted by KRC Research found that 78 percent believe video games should be afforded First Amendment protection. We look forward to presenting our arguments in the Supreme Court of the United States and vigorously defending the works of our industry's creators, storytellers and innovators." We've contacted the California Attorney General's office and will update this story if and when they respond. California Senator Leland Yee, though, posted a response on his website, saying in part that he is very pleased with the Supreme Court decision. "The Supreme Court has never heard a case dealing with violent video games," he wrote. " I am hopeful that the high court will determine our law to be Constitutional, but regardless, states are now certain to receive direction on how to proceed with this important issue. 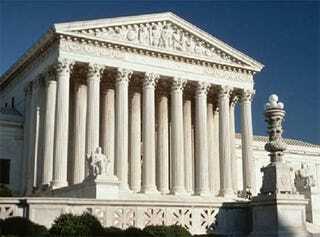 In an analysis of Monday's decision, the Supreme Court of the United States Blog, written by the Supreme Court practice of Akin Gump Strauss Hauer and Feld LLP, wrote that the justices could have sent the case back to the Ninth Circuit Court to weigh the impact of the U.S. v. Stevens decision, which struck down federal law that banned the depiction in videotapes of animal cruelty.